"HEY, I agree...the Gorkla-ball is a helluva pitch, but you've killed five guys already." John, you are sooooo fun when you are silly. Will you QUIT snapping the ball back with your tongue! The Umps beginning to suspect something! "It's not my fault you throw like a venusian girl, now stop with the curve!" It shouldn't be "stop with the curve," I typoed, it is "Start with the curve." Just keep your eye on the ball. Dude, maybe baseball isn't the right game for you. You really lack DEPTH PERCEPTION!!! When the skipper said "Eat up a few hitters while the closer gets ready," I don't think that's what he meant. You shaking me off, MEAT? Huh? I'm talk to you, Meat! You shaking me off?? So I only got 4 fingers, what of it? 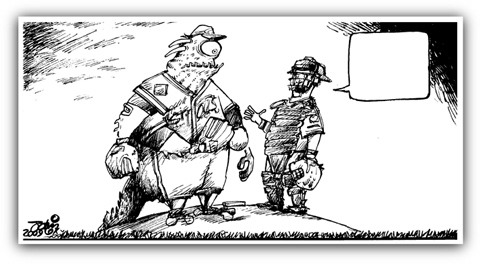 Ref sez it's still a balk when your tail stays on the rubber. Okay, let's try this one more time. You throw ball to me. I catch ball - throw back to you. You can't keep ball. You have to share with other kids. Look, Hermie, we have lots of balls. If they knock it out of the park, we'll get you another one. Why you think you can't catch my knuckle? This page contains a single entry from the blog posted on April 7, 2009 5:40 PM. The previous post in this blog was SOUTHERNESS. The next post in this blog is Magazine cover idea.